The annual Muslim hajj (pilgrimage) to Mecca is underway, and more than a million pilgrims already have entered Saudi Arabia from abroad. Some of the key rituals involved in the pilgrimage are performed on the ninth day of the Islamic month of Dhul Hijjah, which this year falls on Oct. 14. All Muslim adults are expected to participate in the hajj, which is among the Five Pillars (core practices) of Islam, at least once in their lifetime unless they are physically or financially incapable of making the trip to Mecca. More than 3 million people performed the hajj in 2012, according to the government of Saudi Arabia. More than six-in-ten (64%) were men, and more than half (55%) came from outside Saudi Arabia. The overall annual number has been rising in recent decades, and is up by more than a million from a decade ago. This year’s number, however, is expected to be lower than last year’s total because the Saudi government issued significantly fewer visas due to concerns about a deadly respiratory virus. 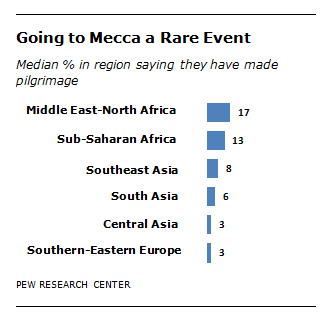 A recent Pew Research Center survey of Muslims around the world found that, across the 39 countries and territories surveyed, a median of 9% say they have made the pilgrimage to Mecca. Those living closer to Mecca are more likely to have performed the hajj. For example, 20% of Egyptian Muslims say they have done so, while just 3% of Indonesian Muslims say they have. The Saudi government issues a set number of hajj visas annually. Although those are free, the trip carries considerable costs, especially for transportation and lodging, and pilgrims must use an approved travel agent. Hajj packages from the United States may exceed $5,000. More than 14,500 American Muslims are expected to perform the hajj this year, according to the Religion News Service. Several of the primary rituals of the hajj involve the number seven. One of them, known as performing tawaf, involves circling the Kaaba (the holiest site in Islam) seven times. Pilgrims also typically travel back and forth between the hills of Safa and Marwa seven times. The hajj coincides with Eid al-Adha, a major holiday for Muslims – including those not performing the pilgrimage – which begins on the 10th day of Dhul Hijjah. Muslims around the world with the financial means to do so traditionally slaughter a large animal, such as a cow, goat or sheep, on Eid al-Adha and distribute portions of the meat to the poor. (Many American Muslims donate to organizations that slaughter animals and give meat to the poor overseas.) The ritual sacrifice evokes the Quranic story of Abraham’s willingness to sacrifice his son for God.